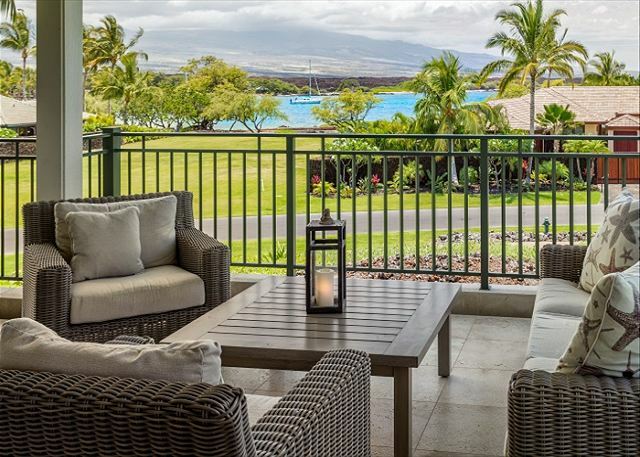 Enjoy a nice ocean view over a vacant lot from Kolea 6E at Kolea at Waikoloa Beach Resort. Along with ample living space, Kolea 6E offers a nice ocean view of A'Bay over one of the few vacant lots remaining at Kolea. 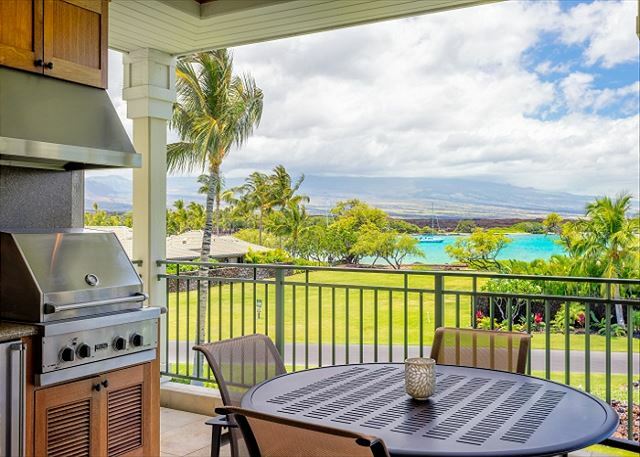 This villa is great for families as well as those just looking for a peaceful getaway in Hawaii. As you enter the villa you will be astonished at the size of the great room. 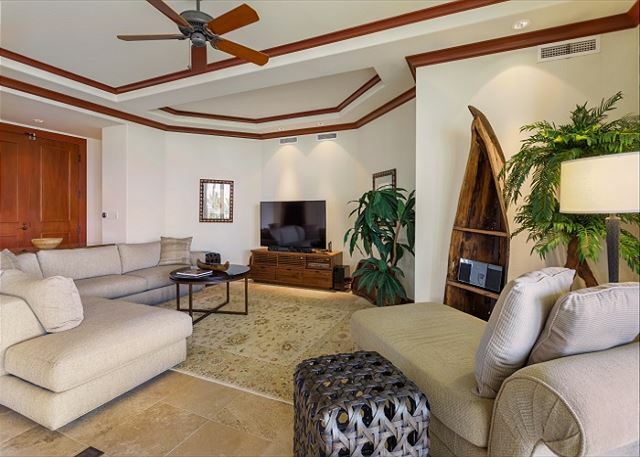 The living room has two sofas facing the entertainment center with a wall mounted big screen LCD television with a sound bar, BluRay player, and extended cable with a DVR. 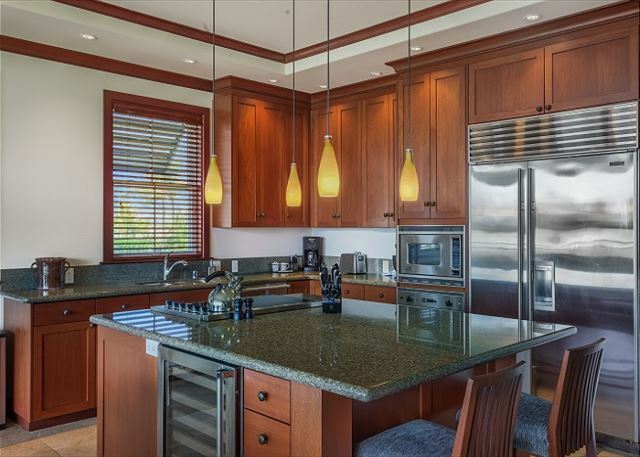 On the other side of the great room is the spacious kitchen featuring granite counters, stainless steel appliances, and a wine cooler. The kitchen is well stocked for all of your cooking needs. The dining area is located nearby and seats 6. 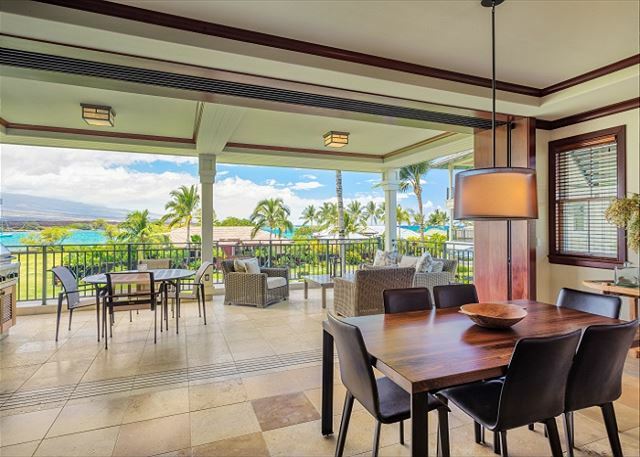 Open the large pocket doors off of the great room to enjoy the expansive lanai. Having these doors open allows the interior to seamlessly transition to the exterior bringing the sounds and scents of the tropics into your villa. 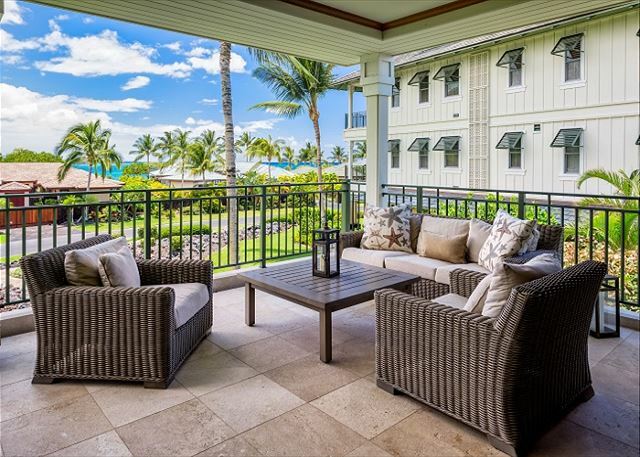 Located on the lanai are two love seats and a chair. There is also a grill and wet bar for your use. Enjoy the beautiful view of A'Bay from here. On one side of the villa are the two master suites. 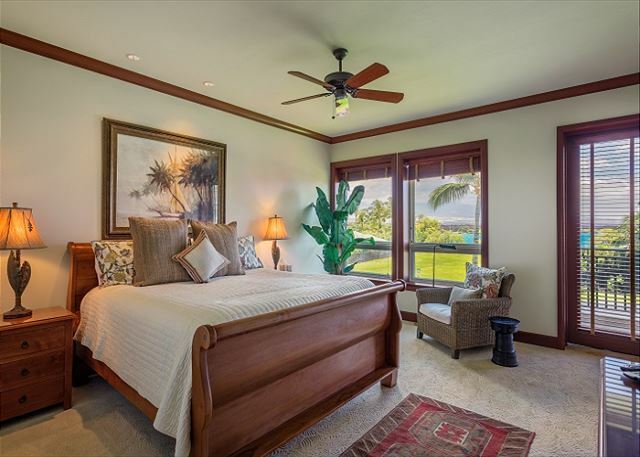 The first master suite has a king bed with bedside tables facing an LCD television with extended cable. The large windows offer a view of the ocean. The master bathroom has dual vanities, a deep soaking tub, a large walk in shower with multiple shower heads, and views of the ocean. 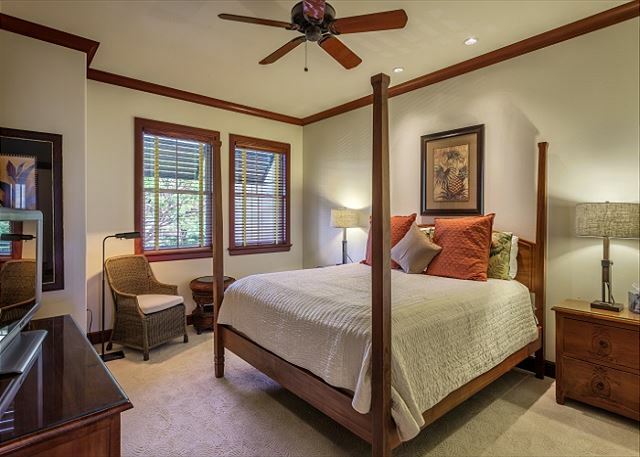 The second master suite has a king size bed with bedside tables facing an LCD television. The attached bathroom has dual vanities, with a walk in shower and a deep soaking tub. On the other side of the villa is the guest bedroom. 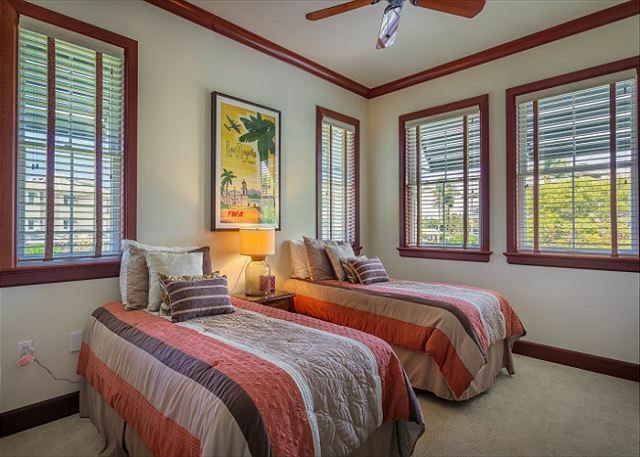 Here you will find two twin size beds with a bedside table facing a television. The attached bath has a walk in shower with a vanity. A half bath powder room is located just off the living area and is adorned with an elegant copper sink. Other amenities of Kolea 6E include dual zone air conditioning, a full size laundry room, and wifi.